I'd say it was late winter when it started to become clear that the Dolores was going to run. The calendar on the wall sitting vacant May and June suddenly became something more. 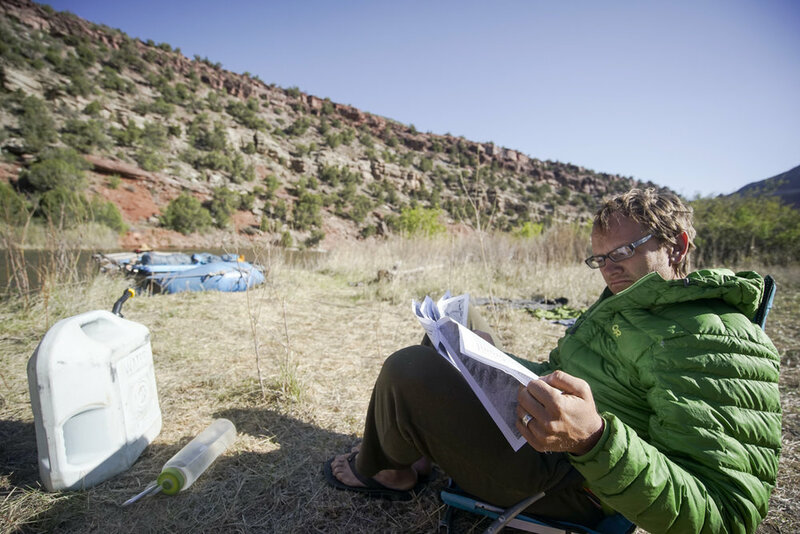 This was the event of the year in terms of trip planning and primacy was given to that hunk of time which most might corresponded with a stout dam release. But when? What section should we hone in on? After a bit of frantic flailing on my part to secure "enough" time off from the j-o-b my buddy Chad and I decided we were going to go for the whole shebang. 170 some miles from Bradfield to Dewey over ten days. We watched and watched as the ever changing dam release forecasts were published, then altered, then altered again. About three days before our scheduled launch we realized we would be shoving off at the peak of the "pulse flow," 4000 cfs (give or take) for the first day and a half. Flows that had not been seen in quite some time. The weathered sign at Bradfield, complete with hand-written shuttle offer! Preconceived notions! We arrive at the putin around noon. On a Friday. I had prepared myself for a crowded scene, people jockeying for position on the ramp, trailers backing in and out, an air of tension. As we pull up a small crew is just shoving off and within minutes the ramp is completely empty. Not feeling hurried and awestruck at our luck we crack a beer and sit silently each fully aware of the weight of the moment - to be here, on this ephemeral river at these flows with the ramp to ourselves and the longest trip in the registrar. A solitary picnic table sits half submerged - all here seem to be confused with the sheer volume of water coming down from the dam. Its been a while. The current is fast, the river beyond bank full and frothing. The flow will begin to abate tomorrow morning at 12:01am with a draw down of roughly 800cfs/day until flows hold in the 800-1200cfs range for the remainder of our time on the river. Dryboxes are latched, drog bags stuffed, coolers battened, and various deck side dry bags are strapped down and with little fan-fair we push off. 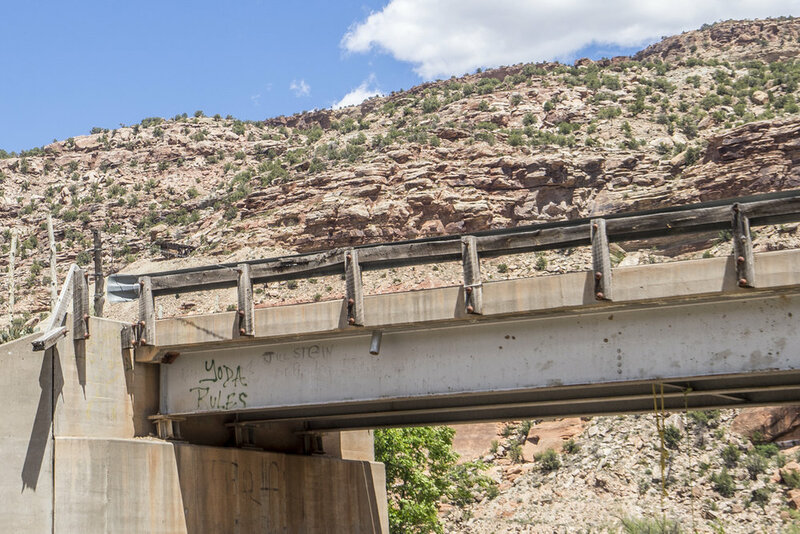 It's a little after 2:30 in the afternoon and we have some 20 miles to make before we meet up with a group of Moab-ites at the Dove Creek Pump Station who're base camping and running laps on Snag spanning the height of the runoff. We look forward to sitting by the fire hearing of the day's carnage as well as any generalized beta. Shortly after disembarking it becomes obvious that making river miles will not be difficult. The river is cranking. We slingshot around a sharp left hand bend and spy a thick bullsnake floundering in a roiling eddy - apparently not everyone got the memo that they were turning the river back on. The river in this upper section is steep and the banks cluttered with Box Elder, Oak, and Ponderosa. Occasionally - in a preview of what is to come - crimson bands of sandstone sprout up from the jeweled blanket of green. Of course its hard to take it all in - we're moving so damned fast, the river like a jubilant child freed from the confines of the classroom for the open fields of recess. In the planning phase we vacillated on craft of choice - largely a response to flow projections. When we realized we'd be riding the meat of the crest we opted for the bigger rafts, eventually settling on sharing Chad's 14.' The decision to share was in the end a response to the tough/small camp landings and the ability to help each other out in the event that either of us suffer an injustice at the hands of the river. We've opted for freeze dried food for convenience - neither of us wanting to deal with the trappings of the raft kitchen. I've brought a token loaf of bread to stagger the backpacker fare with PBJ's - well PB's no J (cant find it at time of launch). I think we may have thrown in some coffee creamer somewhere. Otherwise the cooler is comprised entirely of beer. We have many days and many miles to travel after all and like a doctor friend of mine likes to point out - "You can in fact survive in the desert if you only have beer." I am not one to act against medical advice. Around 5:30 after spying a small ancestral granary stuffed into an unreachable alcove we round a corner to spy more modern structures on river left. We have arrived at our rendezvous location. "We're looking for a green cat boat," says the boatman. We continue to hurtle downstream as a truck trailoring said boat flies by in the opposite direction. We quickly pull off and walk upriver just to check. Locating our group we are given a gracious car ride back to the boat for a valet camp de-rig. The evening finds us 'round the fire listening to stories of flips, wraps, greased runs, chaos, and a spectator like setting complete with ATV's and locals picnicking downstream at "Snag." The anticipation is nearly to much to handle as I head to bed. Tomorrow we run the gnar, I am nervous but also thankful we've joined up with a friendly and dialed group. In the morning we linger in camp. Worth noting is my first time here occurring at precisely the moment when our collective knowledge of this place is in a state of transition. The Dolores - due to years between the briefest periods of "boatable flows" - is deficient when it comes to online beta (trip reports, instagram fotos, youtube videos, etc.). The river seems to exist momentarily in limbo and I realize as a result of 2017's rather lengthy floating window its online obscurity is destined to end. I can already envision the hashtags. As a result there is an innocence due to a lack of general voyeurism that is all the more romantic for a first timer like me. The River of Sorrows will no longer reside in some unseen or little visited corner of the internet or our minds following this Spring. I wonder what effect this outpouring will have on this place knowing full well the dam back upstream ultimately has more to say about visitation than anything else. The river gradually grows rowdier transitioning mile by mile until a low din downstream grows louder. We begin to see boats tied off on river left signifying that we've arrived at our scouting location. The road alongside the river makes for an easy scout as well as access for the locals to come and perch, circling the shores like birds looking for roadkill. The rapid is loud, frothy and long. We scout it in three separate sections and come together in the run-out to compare notes. I've been told the rapid is actually easier at higher flows, the the drops are steeper and more pointed at mid to low flows. The upper two cruxes are fairly obvious and our focus turns to the "Snaggletooth" where an explosion of water pillows and detonates over a nasty upright slab of erect rock. "Just miss that and it's all good" says a humble Colin. Suddenly we spy a green Sotar style the boiling torrent. The peanut gallery hollers out in praise as the boat - smiles flashing - whizzes past. "That's the line" states Colin. Go time. The longer one looks at these things the more our evolutionary biology kicks in. Rationalization and risk mitigation begin to creep in. Helmets and dry-wear applied we shove of following Colin who exudes that rarest of symbiosis with all things wet and flowing. Before we can blink its over. Everyone has stellar runs and cold beers are shared below the rapid. Its a wonderful moment - humans bound together by shared experience and acknowledgement that its more likely than not that no one will be here this time next year as a small trickle parses its way between exposed boulders that provided for such an exhilarating ride. We assist the Moab crew in packing their trailer as goodbyes are said. We're suddenly left to our own devices, still eight days and some 140 river miles from our end destination. With no other better plan we climb back in the boat and push off. We run "The Wall" rapid before finding an open meadow-like expanse on river right to call it a day. I throw my tent up hastily on a thick mound of grass and tuck in for the night. Foggy brains are tested in the morning as we attempt to carve out a rough itinerary for the coming week. It's harder than it sounds and maybe we don't want to acknowledge that this thing we're doing eventually has to end, and unlike other rivers there is the nagging near certainty that this whole experiment will not even be an option next year. The question of the morning becomes where do we want to slow down, where do we want to blast on through, and where can we/should we get out and stretch the legs? After much adding/subtracting river miles and dividing by days remaining we conclude we "need" to make 10 miles for the day and plan to shoot for "Tree Frog" camp. The river, supposedly in the 3200cfs range and dropping is still punchy. Just downstream from camp we follow a sweeping left hand bend and enter the start of a continuous stretch of II-III called "Three Mile" comprised of splashy wave trains and avoidance of large boulders. The landscape here is in flux. The impenetrable emerald carpet of green begins to thin as red streaks of bedrock signify we're leaving the high country and spilling into the desert. Soon we spy our first solitary cottonwood stretching defiantly tall and proud - for two desert rats this is a calling card of home. Mid-day we leap frog another group of locals - of course Chad knows all of them. A note should be made here about the general atmosphere of those we pass on the river and in camp. Everyone is so elated to be here, to get a chance to float a river defined by uncertainty and the revelry is palpable. Passing by one is treated to various hand gestures, underhanded tossing of cold beer, whoops, hollers, and howls. In our chosen place of worship the congregation has gathered at the river to witness the miracle of resurrection. We soon come to our camp on river left - the entrance so small and tucked in we nearly miss it due to the still charging current. Gear is unloaded and we decide we've worked too hard and nap under a grove of box elders. Arising in the late afternoon we transition from flip flops (or bare feet) to hiking shoes and strike out for the rim. The higher we climb the larger our surroundings become as the narrow river valley shrinks in comparison. For all the illusion of wildness there is an underlying domesticity to it all - water turned on and off with the imaginary push of a button. We crest a rolling hogsback as a growing desire to free myself from the confines of the river corridor grows. We pause briefly to shake free from the macro to examine the micro - in the distance the siren song of a sinuous side canyon comprised of fluted pink stone beckons us. This particular side draw holds numerous small graceful pools of water as we find a perch to gaze. Tree Frog camp lives up to its name as the heavy silence is pierced by intermittent frog call. Animalia on display - we've heard people talk about and seen ourselves several snakes on the journey thus far. It seems a paradox - how healthy the fauna appear to be in spite of our hydrologic tinkering. I can only think that our long periods of absence imposed by lack of boatable flows has provided solitary creatures the confidence to reemerge. The snake particularly; such a shunned symbol in western mythology it could represent the anti-human or in this case the wilderness. Not so much evil but that which happily resides outside civilized life. For me they're a indicator of restraint, a harbinger for lack of roads, trash, footprints, smokestacks, neon lights. Time moves slowly from our vantage as passages are read from hard bound books and ink is put to paper. Its a wonderful way to spend the late afternoon. Eventually we make it back to camp in the early evening. Gin and tonics are made as I opt for a PB sandwich (still no J), Chad chooses from a prolific catalogue of backpacker cuisine. Day stretches into night and we move riverside as the moon rises up from behind a mesa on the opposite bank. The rushing current now back-lit flows like molten silver as the raft bobs gently in its small parking space. Utterly peaceful it causes the eye lids to sag, the heads to bow, and we decide to call it - Chad opting to throw down on the front drop as I head for shore. Arise to a menacing sky. Clouds billow, the sky slowly expands as it darkens. In the distance rumbles of thunder. We pack up - 30 miles on the docket - casting off atop a still dropping river (2000-1800cfs?). Into the void! Campsite void that is. The immediate 20 miles is comprised largely of private land and reed overgrowth cover both banks. The river here resembles a relatively pristine wetland as we snake through the connective tissue between "sections" grasping some semblance of where we came from and where we are headed. After an hour or so the rain comes fast and furious as we pull over, graciously offered a small spot to tie to a hunk of reeds we pop the bimini. When in doubt drink beer as everything becomes more socked in the rain growing in strength. After an hour we unties and cast off under deep (dry) overcast skies. Soon we pass the small outpost at Slickrock and see two groups coming and one group going. We exchange pleasantries and inquire if the Chuck Wagon Cafe is open though no one seems to know what the hell we're talking about. Down river a ways we see the first of three bridges as we scurry to lower the bimini due tot at the apparent lack of space between the river and underside of the bridge. I glance up as we zip under and see a "Drain It" sticker which would also be not so subtly broadcasted on the next two structures - fitting messages as we spill into and out of Disapointment Valley. Large blocky hunks of sandstone have rolled into the river between Slickrock and Gypsum Valley. The side facing the river is pock marked with entire villages of swallow nests who flutter madly from their primitive homes as we slide past. What appears as chaos seen turns to a swarming complexity as the flock conjoins in the sky and wraps itself in and out in a fluid writhing patters set against an alabaster sky. Continuing on we hear the call of canyon wren, peregrines, swifts and pinyon jay. The ecology of river corridor momentarily seems healthy until the "Private Property" and "Keep Out" signs begin to multiply. We round a corner and spy a flashy new starter castle perched river left. Standing out like a sore thumb its sheer size an affront to the diminutive stream we ply. 5 beers deep and 21 miles later we arrive at the Gypsum Valley boat launch. Our speed so great and wake so silent the two parties busy rigging notice nothing as we slip silently past. Around mile 60 a snow-capped La Sals dominate the horizon. Lankdmarks in the distance I am instantly rooted in place, my location understood and internalized. It is thoroughly odd to see this particular island range from a new vantage point - let a lone a river - and somehow the view doesn't quite fully compute. Soon there after open range begins to close and we enter the Dolores River Canyon Wilderness Study Area. Layered sandstone defiantly takes center stage as clusters of pinyon and juniper cling to ever growing walls. We meander silently necks craned until we see a man-made break in the dense layer of reeds on river left just large enough for one boat. Unable to row we each lie chest to tube and tug on draped foliage (poison oak) in see-saw fashion until the raft is parked in the small inlet. An obvious trail leads up to a sprawling recessed overhung alcove. Not fully understanding where we are it takes a moment for the pictograph on the back wall to introduce itself. We take a moment to let this welcome surprise sink in. We bed down sans tent in the back of the alcove (joined by a friendly crowd of black widow spiders) as a gentle rain lulls us to sleep. In the morning we arise to patchy clouds as the full throated siren call of the river reverberates off the back of the alcove. We've each acquired a touch of the poison ivy and realize too late that it is in fact surrounding the inlet that the boat is parked in. Chad's particular ailment would grow in veracity in the coming days and require an official medical diagnosis and antibiotics on the back end. We stumble into the morning, decide to stretch the legs and begin to climb for the rim behind camp. One weakness in the cliff bound is found, then another in our quest to find the top of Andy's Mesa. Who was Andy and what the hell was he doing out here? Climbing higher the views downstream are nothing short of spectacular. We can only see so far, distance itself twisting as we attempt to unwind Slickrock canyon with our eyes. This place has another name - "Little Glen Canyon" and while I think their shares little relation in physicality the name does lend itself to the fleeting nature of this river. While the Dolores has not been lost like the Glen it none the less is a less than permanent fixture on the landscape - its existence defined more by the dam upstream than anything else. We reach the top of the Mesa taking in the full arc of a sweeping left hand bend in the river course. After 45 minutes or so of listening to the faint ripple of river we head back to camp, pack up and shove off for what the more responsible side of increasingly uncritical minds have calculated to be a 25 mile day. Slickrock canyon becomes more entrenched less linear as we continue downstream. Sunlight has trouble keeping up, the wind becomes thoroughly confused trying to find us. We are traveling at an easy 5 per, no rowing other than corrective strokes, naggingly necessary to avoid the occasional mid stream rock or cliff face. High above the canyon Wren laughs at us - overly confident in his locomotive effeciency compared to our languid detours. We pull over right right to inspect some supposed rock art and are treated to an elaborate panel of whimsical petroglyphs - the most prominent figure bearing striking resemblance to the pictograph from the previous day; its wings like the desert sky - beaded pearls of moisture dangling above an arid land - fitting iconography for this struggling basin. Each finding inspiration we trade off on the sticks. My companion adding to his ever growing catalogue of imagery for the studio back home. The river continues to drop and its easy to forget the artificial-ness of it all. It all appears so natural, everything in its right place. Ever so often I'm snapped back to reality as we pass now bare rocks holding massive piles of wood, the calling card of the draw down. Things down here are shifting. I imagine upstream someone casually punching the clock after the cursory water-cooler chat they push the button to continue the draw down, every solitary drop measured and accounted for. Out of no fault of its own the river imposes a tyrannical pace as we hurtle to environs more arid. We glide past one side canyon then the next, all seductively tempting in their own regard. As we see the mouth of Bull Canyon come and go we decide we can do this no longer and decide to make proper introductions as Leach Creek. The entrance could be easily missed as we make our way into the narrowing backwater. The lack of current lends itself to a grotto like atmosphere as we ship the oars and use the cliffside as leverage until we can progress no further and tie up for a small walk about and lunch. We pull into camp at "The Notch" and erect a spartan camp by rafting standards. Roughly a five minute walk from camp one can plant themselves at such a vantage as to the the entirety of the river snaking up and then downstream of what is known as the mule ear. In the evening we build a little twiggy fire as stars ignite the sky. We laugh, reflect, and attempt to solve the worlds with increasingly irrational solutions as we seethe with Gin, all the while doing our damnedest to forget that we're exactly half way through this adventure. Night turns back to day, some realities we are unable to escape. Cotton-mouthed I stumble out of my tent to see my ship mate pourings coffee into the large french press. "Join me in the saddle?" he states. From our vantage we receive the morning sun - a balm infused with gentle warmth and a hint of promise - as the rest of camp is draped in shadow. The river snaking its way in a wide arc, appears to be momentarily ambivalent before deciding to flowing north. Again, I find myself asking how this can not be a yearly scene? Set against the sparsity of the desert the river here just looks so right, its very existence unquestioned. It is a painful, confounding realization then when you understand the shimmering mirage in the desert - that fantastic outlandish occurrence - is not in fact the verdant green fields and rows of alfalfa in the desert but the river before us. Somehow we've all collectively agreed to this reality that we've created; bedrock and paradox. On a positive note I realize how lucky I am to be here, to have had the good fortune to jump at this certain form of cosmic coincidence - a freak meteorological event influenced by infinite variables lay down enough snow in a small mountain range in SW Colorado to fill a reservoir just enough to allow the flood gates to temporarily open and all this to happen. To not honor this curious course of events seems damned near a sacrilidge. The morning turns to afternoon and with it the sunlight becomes uncomfortable time to get back on the river. We pack up camp, do our daily routine of fuzzy math and put together what we feel is a responsible itenerary for the day and cast off. We haven't seen anyone for a few days, somehow we ended up in a void and overall the river has been much less crowded than we initially imagined. We take our time communing with that small bit of Slickrock Canyon we have left, running "One Holer," "La Sal," and "Madame Curie" rapids in quick succession. In the early afternoon the canyon recedes as we spill into Paradox Valley where a defiant river took the path of most resistance and chose not to situate its currents with the natural egress of the valley but instead cut right across it. We are positively in the desert now and decide to pull over the inspect some more rock art and desert tracks. While doing so we run into some more Moab-ites that (of course) Chad knows who're headed for the take-out at Bedrock just a few miles downstream. We exchange highlights of our respective trips thus far and the departing group hands off excess potable water (we're low) and the holy grail - fresh fruit/veggies. The launch site at Bedrock is busy with people departing the river but absent anyone putting in - a good sign that we're entering yet another void. Pressing on a few hours later the "hanging flume" begins on river right, bolted high to the canyon wall it appears to be in varying state of disrepair. The "flume" was constructed in the late 19th century in scheme to mine gold from placer deposits along the Dolores River. The type of mining done - hydraulic mining - required a constant flow of water to be efficiently transported to the site. To all accounts a boondoggle, construction took three years, utilized 1.8 million board feet of lumber for its 12 mile span and ended up costing nearly $100,000. 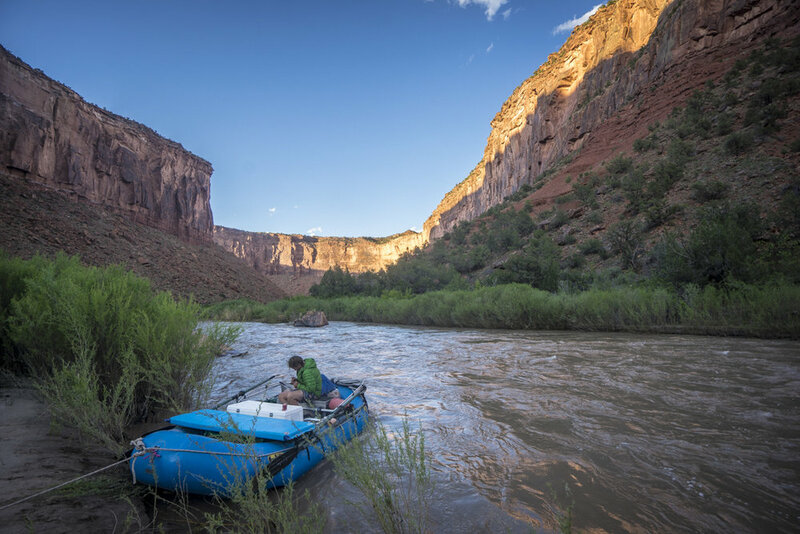 When in use it was estimated to carry 80,000,000 gallons of Dolores river water per day. A good reminder that resource management - a-la the dam - is far from a new occurrence on this particular river. In the late afternoon we pass the mouth of the San Miguel river flowing in from the west. In addition to the added CFS its brings with it highway 141 which will stay with us until the town of Gateway, Colorado. 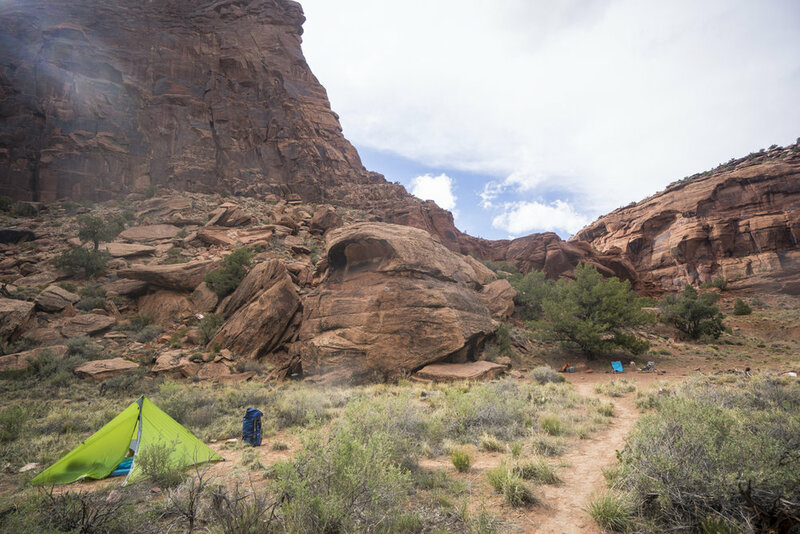 A few miles later we pull off at a well used camp on the right at the mouth of a small side canyon calling it a day. In the morning, as is often the case at this hour in the desert, all seems right with the world. Eyes open at dusk my sleeping bag is damp but the ambient temperature even in the shade is pleasant. Soon, first contact with slanted shafts of new day light filter through the cottonwood draped over my bag and gently warm my face. Moments like these, so fleeting, are why I prefer to sleep out and not in a tent - I am in fact #optingoutside. I glance towards my feet to make sure the boat is in fact still tied to the thick clump of junipers we've anchored to and spy Chad still asleep, bobbing up and down in the surging current atop his drybox. Across the river remnants of the hanging flume hang just as they have for one decade. Some pieces hang vertical, some no doubt have fallen in the river to be carried away. Set against the canyon walls its a stark contrast the yawning chasm between "modern" and old - though even the red walls are not immune as they slowly crumble, falling down themselves; we all return to our maker. There is no rush to the days schedule and I decide to stretch the legs behind canyon, unwinding a small drainage that eventually leads to a large pourover crowned with an arch which reminds me of that well known scene on the eastern shore of the Escalante river far from here. Eventually I make it back to camp and the heavy lifting is done as we disengage rubber from sand. Onward. Ever onward. We float silently through this winding canyon, the wind at our back. Occasionally yellow metallic diamonds peak about scattered strata and we're reminded there is a road up there. We don't hear many cars. We round a bend where a large overhang is streaked with varnish as broken crimson strata runs parallel creaking the look of a kind of desert plaid. History exists here in layers and its as if we're pumping time back into the desert bedrock itself. The hanging flume is one strata - older in vintage - while the road dark and twisting has a more modern flare. All found high above a river whose flow can start and stop with the push of a button, the soggy sand on the river bank drying in the intense midday sun as the draw down continues is perhaps our great uncomformity. Efficiency seems to be the goal. A reductive state where output vastly exceeds input. Whole revolutions, the toppling of dictators have been populated by a single modest hash tag. We are an industrious species. We like to romanticize dominion, codify it in our religious texts but progress is fickle and seems to me that the paradox of the modern age is a belief that we are separate - not a part - of the natural world. Believing this, our destiny mirrors the fate of the layered strata above; our story to will come crashing down, falling apart in a spectacular fashion only to be carried away downstream. Yoda rules. Jill Stein for President. In the early eve we pull into a road side camp. Not too much traffic out here. As the light slips out of the canyon some draw on inspiration. How this place changes on its way to the Colorado. A few days ago, bundled tightly against the chilled night air, I wormed deep into my greasy sleeping bag beneath a grove of Ponderosas. Now, down here, some 100 miles later I lay out on a powdery beach in my shorts, contemplating a great thrust of slickrock and the way the moonlight is splayed against a splintering of stone, the silver light pooling in crevices, spilling out of alcoves and dripping into the river to join the molten silver on its journey north. In the morning we continue our journey. Crossing into Utah I search for the colorful billboard with the image of Lake Powell and the bumper sticker platitude about "life elevated!" but there is no welcome sign and we resign ourselves to just trust we're on the right path.....in the right place......at the right time. Spilling into the verdant "paradise" of Gateway, CO we become momentarily confused by the lush environs. We run the ugly and tricky "Diversion Dam" rapid - basically a large horizon line on the river with the drop filled with backfill, rusted boat tearing rebar and slabs on concrete. From above the rapid we can't see a clear line and pull over on the lip of the drop on river left. I hold the boat while Chad climbs to a higher vantage point to find that there is a small narrow tongue just below our boat and we drop in. That night we camp above Stateline rapid, the final crux of this 175 mile journey. The scout isn't comforting and the rapid is long and involved. The room for error lower than we like - debris (more rebar, concrete, and rusted equipment) clog the channel and a small but massively consequential L to R cut to avoid a disastrous (read unrunnable) left channel of an island leads us to decide on portaging. My older brother - a better boatman than I can ever hope to be, has a dictum - portaging is good for the soul. We had planned for this possibility at the outset and had packed accordingly - minimalist by our usual rafting standards. As a result the 14' raft, frame, bags and boxes is relatively painless to move to a launch site mid rapid. We navigate the run out and put the rapids in the rear view. In the early evening we pull in at a nice camp at the confluence of a side canyon on river right. We're both aware that its our last night on the river and decide to go for one last walk. Its been a deeply immersive experience, this week plus outing. Its also a trip that will require much mental attention to unpack in the weeks and months to come as this trip will likely not be repeatable next year.....in fact its anyone's guess as to when the Dolores will flow for this length again. We soon hit the confluence with the main stem Colorado. Another Tributary Trip in the books. In some small yet radical act of grace someone has placed a cairn where the bedrock first emerges from the river corridor, the budding stem of a canyon which somewhere far off downstream becomes truly Grand. Old meets new as we round a corner and the Son of Dewey (ain't got no soul) comes into view. The Old Dewey Bridge, support members swaying in the breeze serves as one final reminder that the story of the Dolores cannot be told without including us. The river harbors a patience beyond our capacity to understand. Its had a few million years head start. Winding some 175 miles to into confluence with the Colorado its a river that largely serves to tell our story, a tale of choices and decision and the resulting ramifications. Entire ways of life rise and fall upon its banks; derelect ranches, hanging flumes, glittering resorts, a lone pictograph in the back of a cave. But the river is constant, its ability to sustain in this harsh landscape exuded in a patient resilience that exists far outside the human condition. The pooling of its waters behind white concrete walls is little more than a footnote in a much larger and longer story. It is a gross display of hubris to think our impacts are permanent - that the lifespan of reinforced concrete at the headwaters will register but momentarily in the rippled lifespan of this river. More likely is that the slack water upstream is a brief reprieve, a chance for the river to catch its breath before getting back to original intent - the carving of the very fabric of the earth itself. The story of the Dolores is ultimately one of impermanence. The essential truth then in the end is that which will fade is not the river but us.